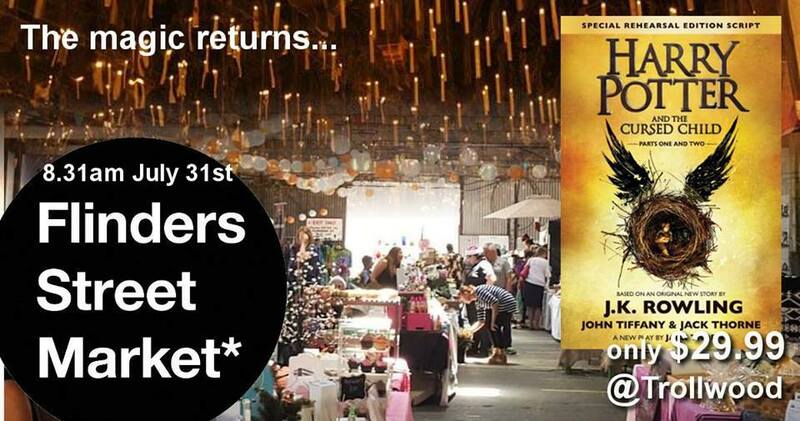 The already popular Flinders Street Market is about to become a favourite for lots of Harry Potter fans out there. On 31st July, the big blue shed will be hosting a celebration in honour of the worldwide release of the new book "Harry Potter and the Cursed Child". So grab your magic wands and broomsticks and make your way to Flinders Street Market from 8:30 am. Purchase a copy of this new release for $29.99 at the Trollwood stall and enjoy treats from Alyssium Delights including Butter Beer, Weasley's Dragon Roasted Nuts, Caramel Coconut Popcorn and House Cupcakes. What better way to celebrate your favourite book than eating food inspired on the story! Other stalls include creative kid's gifts and cool art from Little Adventures, and crafty stationery from Pilgrim Notebooks. Bean bags will be available to sit and mingle with other fans and of course enjoy some Harry Potter trivia! No event inspired on this book would be complete without cosplay, so get crafty and come dressed as your favourite character - you may even win the prize for best costume.